William Branham repeatedly stated that the Bible clearly taught that "we should cast down reasoning". The problem is that there is no scripture in the Bible that states this. Was William Branham adding to scripture? Is there any scriptural support for his claim? Message followers have also stated that, since nothing of any biblical substance can be empirically “proven”, faith is required in order to treat anything in the Bible as fact. It is therefore reckless to hold William Branham to a different standard, and therefore, it is illogical to expect his followers to abandon belief in him on the basis of factual evidence. Does reason destroy faith? Or is reason required to have a true Biblical faith? It is a fundamental principle that to renounce reason is to renounce religion, that religion and reason go hand in hand; all irrational religion is false religion. 1. The Bible is the written Word of God, the revelation of Himself to his people, its contents true and sufficient. 2. Anti-Intellectualism is a lie of Satan, dishonoring to God, and the fundamental breeding ground of the ignorance necessary for large groups of people to be kept in false belief systems. The way that most message believers see it, these two points don’t seem to be compatible. To believe the first point requires faith, and revelation. And it does. But it is the different paths that we take to arrive there — primarily, the subject of point #2 — that will shed much light on how we can stand in absolute unity on the attributes of the bible, while attempting to communicate across galaxies with regard to the message. Jesus said the greatest commandment was “You shall love the Lord your God with all your heart and with all your soul and with all your mind”. (Mat 22:37) What does it mean to love God with all your mind? The Greek word for "mind" here is “Dianoia”. There are many Greek words that Jesus might have used if he meant that we love God simply by thinking about him. The implication of this word choice is abundantly clear here. We are to love God with all our mind by using the gift of intellect that God gave us to make good, balanced, informed decisions through critical thinking, and thorough reasoning. This flies in the face of everything we were taught in the Message! We were taught to fear our minds, to distrust the mind as evil, to cast it aside as an abject hindrance to faith. The irony is, we have no trouble following Jesus’ command when purchasing a home, or a car, or looking into a business. Most message believers would agree that it is basic God-honoring Christian stewardship when we make decisions in exactly this manner. So why is it, that when it comes to important spiritual matters that we delude ourselves into thinking that the life of the soul is so utterly detached from our brain? Why do we think we should give up the faculties of our mind (our dianoia) altogether in favor of, presumably, faith? That is the problem. We have been programmed to operate spiritually from a faith vs. reason paradigm that says that in order to activate faith we have to deactivate reason. The problem is, the Bible teaches no such antithetical relationship between the two. God intended them to work in perfect synthesis, with spiritual faith working at a higher level above our human capacity to reason, not in a vacuum devoid of all logical sequence of thought. There was an individual who initially believed that Jesus was the messiah but then started to question whether this was, in fact, correct. We can all learn from Jesus' example. I baptize you with water, but he who is mightier than I is coming, the strap of whose sandals I am not worthy to untie. He will baptize you with the Holy Spirit and fire. 17 His winnowing fork is in his hand, to clear his threshing floor and to gather the wheat into his barn, but the chaff he will burn with unquenchable fire. Was Jesus upset when John questioned who he was? No! Then why are so many in the message upset when someone questions whether William Branham was a great prophet, or even a prophet at all? This was not the pattern of Jesus. Jesus was fine with John's question. Did Jesus tell John's disciples clearly that he was the messiah? No! What did Jesus do in response to the question? He simply pointed to the evidence. But why do message preachers get so angry when when someone asks whether the evidence supports William Branham's view that he was a great prophet? This is not the Biblical pattern. Jesus gave the example of requiring people to examine the evidence. The issue is not whether you raise a question. Questions are fine. The real issue is where you go for the answers. Going to scripture and the evidence is the Biblical model. Ignoring the evidence or relying on what some minister, or even William Branham himself, tells you is definitely not how questions should be dealt with. Jesus never turned people away that had questions. And neither should we. Many in the message ignore the many issues we have raised in this website and, when challenged, refuse to engage in any meaningful discussion or even attempt to answer the questions raised. Be ready at all times to answer anyone who asks you to explain the hope you have in you, but do it with gentleness and respect. When asked to explain why you believe what you believe, the Apostle Peter states that we need to be ready to provide an answer. And we are to do it with gentleness and respect. Why is it that there is a refusal to obey scripture? Is it because they know that they don't have any answers? Do not scoff at prophecies, but test everything that is said. How do you test something without asking questions? It is the confusion of this distinction between faith and reason that allows people to summarily dismiss anything that challenges their understanding without honest examination. The buzz word, "revelation", is then invoked in situations where it is neither applicable nor biblical. Instead of shining forth as the awesome work of the Holy Spirit in a believer’s heart, without which, no man can come to God, it becomes the Christian’s version of the Staples “Easy Button”, to be punched immediately whenever information comes into their head that doesn’t fit into their current worldview. Unfortunately, the application of this faulty paradigm results in shallow faith, and a serious, though inadvertent, compromise of integrity where truth can be sacrificed with impunity on the altar of pride, all in the name of faith and revelation. Paul reminded us that we walk by faith, not by sight. (2 Cor 5:7) He did not say we walk by faith and not by reason. He did not say we walk by faith and not by logic. Why sight? I believe it is because it represents the input of the five senses, the empirical data gatherers of our human existence. All of this information is processed by the mind, but little thinking, and certainly little faith is required in order to accept such information. It is raw data, and it has quick and immediate impact on our emotional responses. Animals interact with their environments primarily through this channel. NOT doing that is one of the primary attributes that separates us from them. So how does faith vs. sight compare to faith vs. reason? Let’s say your doctor tells you that you have a small growth that needs to be surgically removed. He says it is not currently impacting your health, but could turn cancerous, and so should be removed right away. He informs you that it is an outpatient procedure, done with a local anesthetic and in the office, with nearly zero risks. You go home and research this procedure and find tons of information confirming what your doctor told you. Your faith has grown increasingly high that you are going to be ok. If God removes it himself, you have a great testimony and will be fine. If he doesn’t, you have a reasonable, grounded faith that in the event of this surgery, you will still be just fine. Now wait. You haven’t ever seen this procedure performed with your own eyes, you’ve certainly never experienced it, and perhaps you don’t even know anyone who has had it done. So why is your faith in the procedure still high? Because you have enough coherent, consistent, validated information to bring you to a sound, well-reasoned, logical conclusion that the most likely result, by far, is that you come out of this surgery in good shape. But what happens when you walk into the examination room on the day appointed? You smell the alcohol. You see the tray of scalpels. You see the nurse prepping the huge needle to administer the local anesthetic, and you get a little woozy, your heart rate goes up. Fear has arrived, and with it, doubt. Why? Because at that moment, you have relinquished control of your emotional response over to sight! Your doubt is not the result of over thinking the situation, it is the result of an irrational emotional response based on the empirical data input of your senses, that took over when you stopped thinking! So how is your faith restored? By prayer? Certainly. But how does that look on the ground, in application. You begin to think, not only of all of the times that God has carried you through situations much tougher than this circumstance, and of his faithfulness to his promises, but also through all of that coherent, consistent, valid information you have recently obtained regarding this procedure, and your mind again traces the logical sequences to the inevitable positive result, and the heart rate comes down, and you relax. Your faith has a solid basis. That is a very basic illustration and does not include divinely given faith. Any person so willing, whether they are a Christian or not, could effect that sort of faith, and indeed they do, every single day. But it is important to illustrate it nonetheless, to contrast faith with sight, and to show the absurdity of pitting faith against reason, when the two are so connected. Please note that there was no empirical proof of what you believe will happen [a positive result for your surgery], but that doesn’t mean there wasn’t a solid basis for your faith. The protestant reformers recognized three elements of biblical faith, noticia, assensus, & feducia, or, in English, knowledge, assent, and trust. The more knowledge you have about the object of your faith, the greater your capacity for faith. The assent is the “amen” from the heart that says, yes, that knowledge is absolutely the truth. The trust is simply acting on that truth. Take away any of those three elements, and you don’t have faith of the bible, the faith that pleases God. Studying the bible all of your life will grant you a good bit of knowledge of God (noticia). Having the conviction that what you have come to know is true is also necessary (assensus), and so is falling back into Jesus’ arms even when you can’t see him, and joyfully putting the one human life you have to live, under his Lordship (feducia). When I read Hebrews 11 with that perspective on faith, my mind was blown. So, let’s explore this a little further and put it to the test. God is a rational God, A God of order and not of confusion. (1 Cor 14:33) In fact, the God of the bible is the only God with that attribute. The Allah of Islam’s ways are so confounding that they believe he cannot be understood at all. The Monistic philosophies of the far East focus on nebulous ideas like the clapping of a single hand, with the full intention of leaving your mind behind, as does Buddhism. What about the capricious, flawed gods of the Greek pantheon? They more closely resemble characters of an HBO series than the creator of heaven and Earth. One must only read God’s declaration to Job (Job 38-40) to be reminded afresh of the awesome, omnipotent, omnipresent majesty and artistry of the God we serve. Only the God of the bible provides a rational, logical explanation for what we see through a telescope and a microscope, only the God of the bible can account for the exquisite sophistication of every natural science known to man. No wonder there is an artificial line in the sand between anti-intellectual, super-spiritual, fundamentalist brand of Christianity and foolishly self-sufficient, atheistic branch science: they’re both holding half of the treasure map, both pieces divinely put in place by God, intended to be lived out fully in Spirit and in Truth by his children. Man did not invent mathematics. He discovered numerals and formulas and rules and algorithms to express the order of mathematics that God put in place that shows up in physics and chemistry and in every segment of life. Similarly, man did not invent logic. He simply discovered the rules and order for thoughts, ideas, and language, that God had put in place from the beginning. In their purest form, all of these orders are purveyors of truth. Two plus two can never equal seven. The truth of two plus two will always be four. A conclusion that follows from a faulty premise is an illogical conclusion. No amount of faith changes either of those situations, ever. Because it’s God’s law and it is true, and it cannot be changed. However, just as with science, that human intellectual order can bring destruction when out from under the proper influence of its creator. Paul said “Be transformed, by the renewing of your mind” (Rom 12:2) He also warned against the type of arrogant knowledge that would raise itself against God. (2 Cor 10:5) In both of these passages, the proper believer’s response is submission and humility, not ignorance. I believe the bible’s claims about itself, namely that it is the Word of God, and that it is true. I cannot empirically prove it to be so, but it is also not an illogical conclusion. Over the thousands of years of its history, its many writers penned the most profound, coherent, beautiful narrative of human history and redemption ever written. Prophecies were recorded, and fulfilled. Promises were made, and then kept. As for the canon itself, that is a miracle of God’s providence. You will hear claims that Constantine or someone else, “changed” the scriptures, that they later added Jesus’ divinity, and so on and so forth. But a Christian who is not afraid to love God with his dianoia will come to the reasonable conclusion, by studying the wonderful science of textual criticism, that such a claim is logically impossible. The early spread of manuscripts in the first few centuries was so rapid, so widespread, that even if someone with power would have wanted to manipulate the text, it would have been physically impossible to round up the many thousands of copies in existence in order to destroy them. That means, had there been such an attempt, that the earlier manuscripts discovered over the last couple of centuries would have revealed such a conspiracy. Instead, they only confirm what we, by faith, already believed to be true, they say the same thing. Atheistic critics will point out that of the nearly six thousand manuscripts that we have today, they do not, in fact, all say the same thing. They will also be quick to tell you that we not only don’t have the originals, but we don’t even have copies of copies of the originals! And if that weren’t enough to make you doubt the veracity of the book you hold to be life itself, they will further torture you by proving that there are over 400,000 textual variants [differences] in those manuscripts. This is extremely disconcerting to the man who believes that even peeking into such matters is a sure recipe for wrecking his faith. But the proper response is not to “hide” behind so-called revelation. The proper response is to seek truth, with absolute faith that the God who is truth is faithful. Sure enough, you will find that of the 400,000 variations, over 99% are of no consequence whatsoever, and are the result of spelling variations, or Greek word order or punctuation variants that result in the exact same English translation. Of the other less than 1%, through careful textual criticism, it becomes apparent when a scribe reading an old papyrus manuscript that had personal notes in the margin (they were used as bibles then too!) wasn’t sure whether a particular sentence was text or note, and so included it to be safe. Or when a manuscript was being hand copied, and when the scribe was looking from one page to the other, picked up the same word where he left off, not realizing that it was 3 lines further down the page, inadvertently leaving off a passage of scripture. By comparing the manuscripts, coming from many different centuries (all the way back to the 1st century) and from widely diverse areas of the globe, it becomes increasingly apparent, that when we pick up our bible, we are indeed holding the word of God, as it was originally written. As for evolution, as one Christian apologist noted, “we can’t get the evolutionists to debate us anymore. Evolution might be the easiest scientific theory there has ever been, to logically refute.” The is a fairly new book, Darwin’s Doubt, written by a highly esteemed scientist, that has them ducking for cover all the more. I haven’t had a chance to read it, but the reviews, many from other scientists, indicate that it is all but a huge blow against Darwinism, and the most compelling scientific expose yet for the proof of intelligent design. My point is this, when you want truth at all costs, it is honoring to God. He is truth. All truth is Gods truth. There is no pressure to explain something away so that it fits your world view. There is no stress, other than whatever social pressure may come to bear on you, because you are committed to changing with wherever truth takes you. My Christian world view isn’t true because I believe it, I believe it because it is true. Because I believe the Bible’s truth claims, with a grounded, reasonable faith, I have no problem admitting that I know that Elijah’s fire really did come down, because the Bible said it did. But the folks on the hillside that day have no need of faith for that particular event. They were face down crying out to the Lord, they saw the vindication. Elijah didn’t do on the backside of the mountain by himself and then come down and tell everybody. Similarly, if Br. Branham’s supernatural vindications had happened, people generations from now would have to have faith, that those pictures came from the sources we said, and that the stories they were hearing were valid. That would be faith. But ignoring mountains of evidence in order to cling to what you already believe isn’t faith. It’s unbelievable arrogance, and is direct defiance to the God of truth. We aren't asking for empirical evidence for supernatural events and fulfilled prophecies, we are pointing out what should be obvious to someone who honors the laws of logic laid down by God himself: they could not have happened, because you have to commit every logical fallacy known to man in order to prop up the claims. That is not vindication. That is our first line of defense, of discernment, the laws of logic that we use every day whether we understand them or not. As for the existence of Jesus, again, that is not only logical, but verifiable by non-Christian historians like Josephus and others. It would be far more difficult to argue that he did not exist. Why is this? Because it is true that he existed! Logic is designed to funnel information toward true conclusions. 1. Jesus of Nazareth was buried in Joseph of Arimathea’s tomb. 2. The tomb was found empty three days later. 3. Dozens of witnesses claim to have seen him during the ensuing month. 4. His followers came to believe that he had been raised from the dead. Now, none of those facts empirically prove that Jesus was raised from the dead, indeed there have been numerous non-believers posit theories that try to incorporate those four verifiable facts without acknowledging the resurrection, and they all suffer from major logical flaws. The very best solution to this problem is that the resurrection happened precisely as it was recorded in the bible. Now I don’t know about you, but digging into this type of apologetic challenge strengthens my faith tremendously. God is truth. 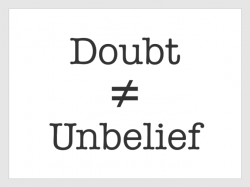 The lack of faith incurred by doubt -- for instance, doubting God’s existence, or not believing that there is absolute truth-- is not a result of too much thinking, rather, it is a result of not thinking enough! John Paul Sartre, the existentialist philosopher, admitted, that with his relativistic worldview, he had no way of asserting that the evils of Nazism were morally wrong. And yet, he admitted that he knew it was evil! If your premise leads to a false conclusion, you must change your premise. It is insane and illogical to do otherwise. This is not a threat to a Christian. Genuine truth seeking with a humble heart will necessarily lead us ever closer to the source of truth himself. It can be no other way. Any line of reasoning that ends up with man at its center, as many philosophies have, or with relativistic moral directives or the absence of them altogether, is a perversion, it is human reason in rebellion, exalted against God, as Paul clearly warns against (2 Cor 10:5) It is also an example of logic gone awry, not because logic was used, but because it was used improperly. 1 Peter 3:15 instructs us to always be ready to give a defense for what we believe. The word Peter uses for defense is the Greek word “apologia”, meaning a rational defense through a systematic use of information and evidence. In the classical Greek legal structure, the prosecution would go first with the “kategoria”, then the defense followed with the “apologia”. It is this imagery that Peter intentionally evokes in this passage. I hope that in some way I have done just that. I do not want to give the impression that I view Christianity as simply a logical worldview. Not at all. My heart sings. My soul cries out. It is my life. I simply focused on the mental aspect here because I believe it is the relevant topic. Our goal is not to “destroy” the message. That would do nothing whatsoever to further the kingdom of God, even seeing it the way we do, it would only displace lots of confused people. The goal is make people think. Let go of your fear. If your view is correct, it will stand up to scrutiny. You may not be able to prove it empirically, as we all believe many things (like the fact that we have a brain... *cough, cough*) that we can’t prove via empirical deduction. But through enough evidence, you can be certain that if someone cuts a hole in your skull, there will be gray matter under there. I don’t think I even need to go into why it is a logical fallacy in and of itself to try to draw a comparison between the faith that you have a brain, and the faith in William Branham’s cloud story. And logical fallacies -- at least in the context they are presented -- are by definition, falsehoods, which are propagated weekly from message pulpits across the world. See what I mean? They may be good men. They might mean well. But by stubbornly sticking to their guns, their integrity is at stake. No matter how you slice it, when you tell something that isn’t true it is a lie! Truth simply HAS to matter more than that to a child of God. This is the biggest frustration in conversing with message believers. They have been so conditioned to say whatever they choose that sounds like it bolsters their position that they have no concern at all that what they say is actually accurate. None! And their mind will never bring them to God. Your mind is reasonings. And God has no reasonings. There is a far great difference between intellectual faith and real God-sent faith. Intellectual faith reasons. And the Bible said that we should cast down reasoning. Don't have nothing to do… Don't try to reason it. Just believe it. See, that's what Cain did; he reasoned. That's what Korah did; he reasoned. It's not him that reasons. "We cast down reasonings." We believe God, no matter what anything else says. We believe God. We don't reason what God says. You can't reason with It. You have to accept It by faith. And anything that you know, you don't have to reason any more. Because, we go beyond reasoning. "Lean not to your own understanding." Faith doesn't reason at all. Faith believes It. First realm is your senses of see, taste, feel, smell, and hear. That's in your outer body. On the inner body, which is the spirit, is reasonings and thought, and so forth. We must cast all that down. I said, "I never asked you to argue, but the Bible does say, 'Come, let us reason together.'" Then, Satan got Eve to listen to his gospel of theology, the gospel of knowledge, higher schooling, higher ethics, better civilization, higher education, and so forth; then when he got the... her to stop and listen to him a minute, to his reasonings (which we are commanded to cast down), when he got her to listen to it. ↑ R. T. France, The Gospel of Matthew, The New International Commentary on the New Testament (Grand Rapids, MI: Wm. B. Eerdmans Publication Co., 2007), 842. ↑ The Holy Bible: English Standard Version (Wheaton: Standard Bible Society, 2001), Lk 3:16–17. ↑ The Holy Bible: English Standard Version (Wheaton: Standard Bible Society, 2001), Lk 7:18–28. ↑ American Bible Society, The Holy Bible: The Good News Translation, 2nd ed. (New York: American Bible Society, 1992), 1 Pe 3:15–16. ↑ The New International Version (Grand Rapids, MI: Zondervan, 2011), Ac 17:11. ↑ Tyndale House Publishers, Holy Bible: New Living Translation (Carol Stream, IL: Tyndale House Publishers, 2013), 1 Th 5:20–21. This page was last edited on 16 July 2018, at 22:50.